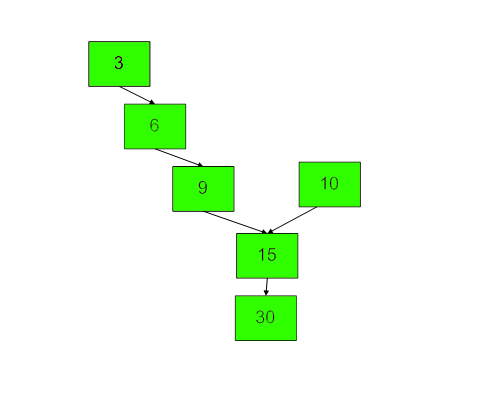 There are two singly linked lists in a system. By some programming error the end node of one of the linked list got linked into the second list, forming a inverted Y shaped list. Write a program to get the point where two linked lists merge. Above diagram shows an example with two linked list having 15 as intersection point. You have to complete the method which takes two arguments as heads of two linked lists. The function should return data value of a node where two linked lists merge. If linked list do not merge at any point, then it shoudl return -1. First line is number of test cases. Every test case has four lines. First line of every test case contains three numbers, x (number of nodes before merge point in 1st list), y(number of nodes before merge point in 11nd list) and z (number of nodes after merge point). Next three lines contain x, y and z values. Note:The Input/Ouput format and Example given are used for system's internal purpose, and should be used by a user for Expected Output only. As it is a function problem, hence a user should not read any input from stdin/console, and should not print anything on stdout/console. The task is to complete the function specified, and not to write the full code.